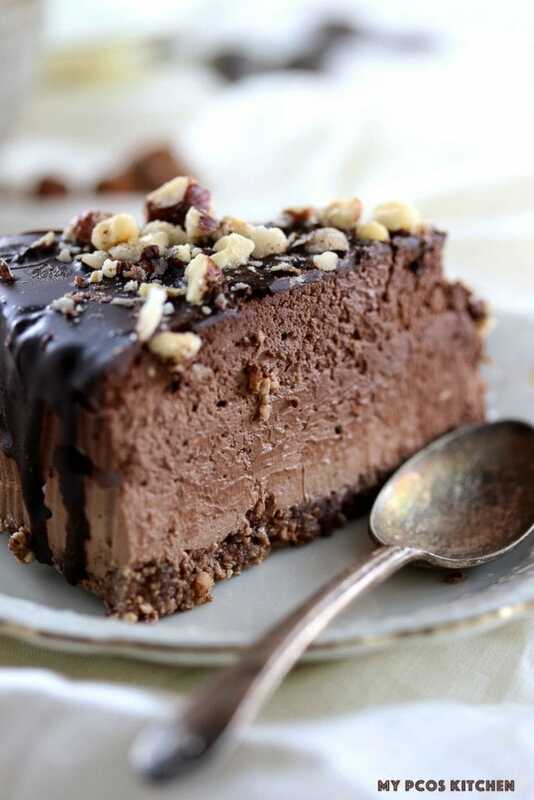 This decadent and creamy Triple Chocolate Cheesecake will make all of your dreams come true. 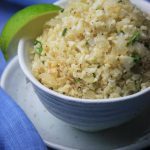 No need for sugar or gluten with this amazing recipe. I think I always say this about all of my cheesecake recipes, but I am pretty sure I have gone to heaven and back with this recipe. This death by chocolate cheesecake is on a whole other level. It’s definitely the BEST cheesecake I’ve ever made. It is so dense, creamy, and so chocolatey. Once you make this recipe, you’ll never go back to any other recipes! 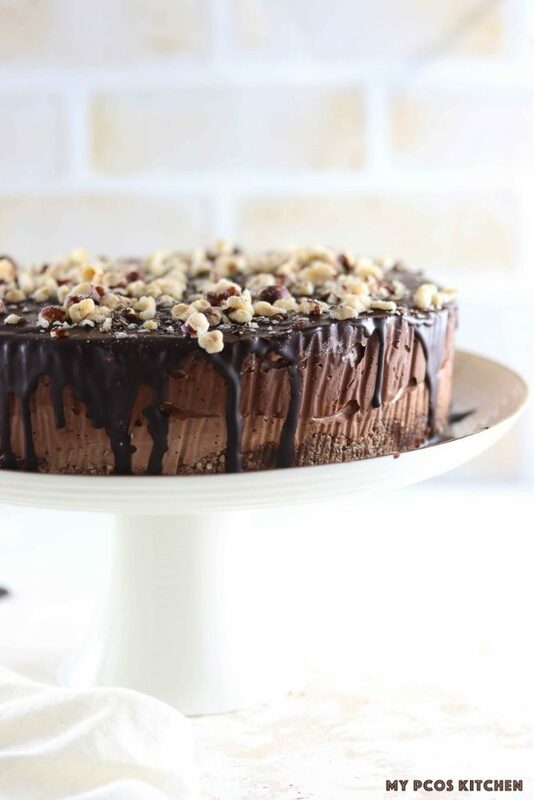 I’ve always loved eating Nutella, that hazelnut chocolate spread, and so wanted to make a keto chocolate cheesecake inspired by it. 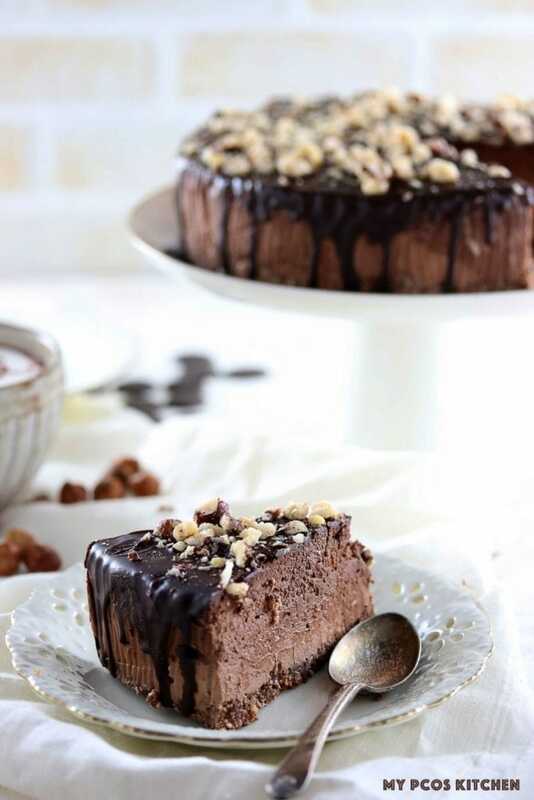 I thought of using my Sugar Free Nutella recipe for this recipe, but I decided I’d make a cheesecake that had hazelnuts, chocolate and a healthy sugar substitute instead. The crust is made with crushed hazelnuts, cocoa powder, butter and stevia powder. For the triple chocolate cheesecake part, I did a three layer kind of cake, where I layered three different coloured chocolate cheesecake batter. So I put some light chocolate batter, then medium coloured and then dark chocolate coloured in my cheesecake pan. You can see in the pictures that the top is more dark in colour and the bottom is more light in colour. I wanted my cheesecake to be a sort of chocolate ombre. It’s a Triple Chocolate Cheesecake because the crust is chocolate, the cheesecake has three layers of chocolate and it is covered with an intense dark chocolate ganache. For this entire keto chocolate cheesecake recipe, I decided to use unsweetened baking chocolateinstead of Lily’s chocolate chips because I wanted to lessen the carb load. I sweetened the chocolate with a combination of stevia powder and erythritol. Unsweetened baking chocolate can be bought in any baking stores or online. It’s usually an equal combination of cocoa butter and cocoa beans with no added sugar. This chocolate ganache icing is incredibly easy. 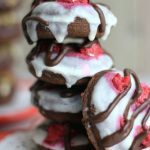 You only need to melt a few baking chocolate pebbles with a little bit of coconut oil and add your sweetener of choice. I decided to use stevia because I didn’t want to add too much to keep it a little bit bitter. The cheesecake itself is pretty sweet so I thought a dark chocolate icing over it would be perfect. Pop that little mix in the microwave and you have a simple icing ready to be poured over any dessert. Just keep in mind that the chocolate ganache icing needs to be kept in the cold for it to solidify. Once your poor it over your cake, it’ll cool down and harden within minutes since the cheesecake will be cold. 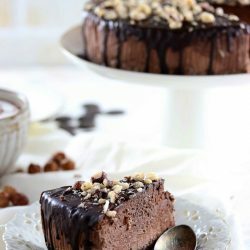 I topped the keto chocolate cheesecake with some hazelnuts which I crushed using my Blendtec for a few seconds. This cake was also baked at a low temperature in a water bath to ensure that it wouldn’t crack. I usually bake all of my cheesecakes in a water bath, I find they turn out much better than any other recipe I’ve tried. I also decided to add some parchment paper all around the spring form pan so that it would be easier to take out. I don’t usually do this because it always leaves marks on the cheesecake, which I don’t think are very aesthetically pleasing. I think that cheesecakes are one of my strongest points when it comes to baking. They have always been one of my favourite desserts and I love sharing my recipes with all of you. If you like New York Style Cheesecakes, you must try my Keto New York Cheesecake which is topped with an amazing layer of chocolate. Additionally, I also have a larger Sugar Free Cheesecake topped with a homemade Sugar Free Caramel Sauce! 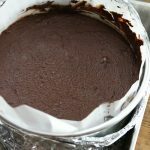 If you’re feeling quite adventurous and want to try baking another chocolate cake, you must try my Low Carb Chocolate Birthday Cake. It has four layers of chocolate sponge, is filled with a raspberry cream and coated in a vanilla buttercream icing! 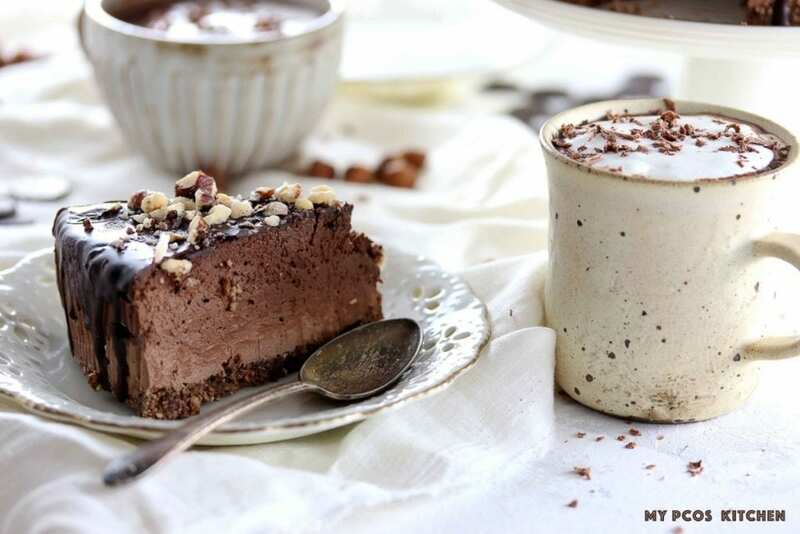 The most decadent and richest chocolate cheesecake you'll ever make. Preheat the oven to 150C/300F. Wrap the bottom of a 9” springform pan with aluminum foil. In a food processor, add all of the crust ingredients and pulse for about 30 seconds to 1 minute until the crust is all crumbly. Take it out of the food processor and add the crust to an 9'' springform pan. Press with your hands until the whole bottom has been covered with the crust. In a large bowl, add the unsweetened baking chocolate. Add the erythritol to the chocolate. Heat the heavy cream either on the stove or in the microwave until hot and bubbly. Pour in the hot cream over the chocolate in batches and mix with a whisk. Mix until all of the chocolate has melted. The batter should be just a little thick. It will also look like the milk and oil are separating, but not to worry! Separate the chocolate into three bowls in a ratio of 3:2:1. For example, the first bowl should have 3 spoons of chocolate, the 2nd bowl should have 2 spoons of chocolate and the 3rd bowl should have 1 spoon of chocolate. Set aside. Add 1/4 tsp of stevia into each bowl. In a large bowl, add the cream cheese and sour cream. Whip with a hand mixer until nice and creamy. Add the 1/2 tsp of stevia and the eggs, one at a time until nicely incorporated. Now, separate the cream cheese filling into the chocolate bowls in a ratio of 1:2:3. The 1st chocolate bowl had 3 spoons of chocolate, so add 1 spoon of cream cheese that that one. This is the dark chocolate layer. The 2nd bowl had 2 spoons of chocolate so add an equal amount of cream cheese. This is the medium chocolate layer. The 3rd bowl had 1 spoon of chocolate so add 3 spoons of cream cheese. This is the light chocolate layer. Mix each bowl separately with a hand mixer. The batter will be pretty thick in each bowl. 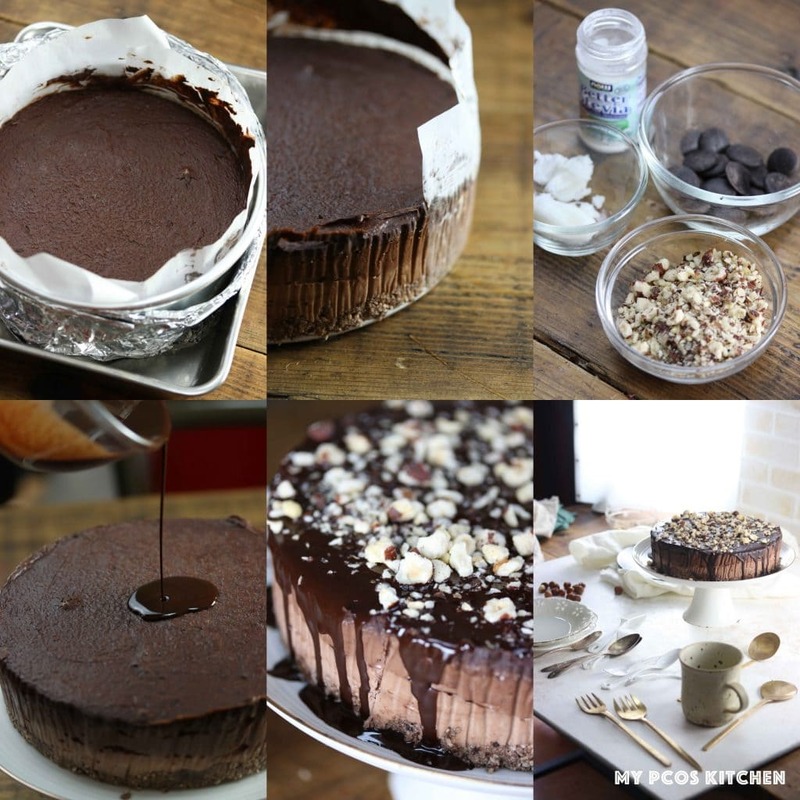 Pour the light chocolate layer into the cheesecake mold over the chocolate crust. Pour the 2nd medium layer over the light layer and spread around. Pour the 3rd dark chocolate layer over the medium one and spread evenly. Prepare a tall oven-proof tray and add 2-3 (1") of water. Carefully place your aluminum-wrapped cheesecake into the water and place into the oven. Bake for 90 minutes. Take the cheesecake out of the oven and out of the water tray and let cool completely. Once cooled, place it in the fridge to cool down overnight. Add your hazelnuts to a food processor and pulse for a few seconds just to crush them into a few pieces. In a medium bowl, add the baking chocolate, coconut oil and stevia. Add it to the microwave and microwave for 1-1:30 minute until the chocolate has all melted. Mix with a spoon and make sure there are no lumps. If the chocolate isn't melted yet, put it back in the microwave to melt for a few more seconds. Take the cheesecake out of the springform pan. Place on the plate or cake stand of your choice. Pour the chocolate ganache over the whole cheesecake and spread it evenly all the way to the sides so that it can run down the cake and make some delicious looking drips. Sprinkle the crushed hazelnuts all over the cheesecake. It is now ready to serve! I put the nutritional info for 10 slices. Now these slices are GENEROUS. THEY ARE HUGE and EXTREMELY FILLING. Feel free to make more slices if you wish, but just one of these will fill you up for hours. What could I use instead of sour cream? We don’t have it here in Greece (that I can find anyway). Maybe a full fat sour Greek yogurt? Yes, Greek yogurt should work wonderfully in this recipe. I followed the recipe to a TEE , same problem as other poster, used a 9 inch pan and it barely made half the pan full.??? Do i now cook less time? Did you include the sugar alcohol carbs when calculating your carb counts? Hi Lorie, the sugar alcohols are included in the fiber amount so total carbs minus fiber will give you your net carbs. Hi, I’m excited to cook this cheesecake for my family this Christmas, I do have a question to You or anybody that has done it, the instructions says “Preheat the oven to 150C/300F. Wrap the bottom of a 9” springform pan with aluminum foil” but In the pictures and video I can see Parchment paper inside of the pan And aluminum foil and the external side, is correct? I just checking because is not in the instructions. Please help! Hi Nohelis, you need to wrap the outside of the springform pan with aluminum foil so that the water from the water bath doesn’t go in the cheesecake. I also put parchment paper inside the springform pan so that the cheesecake batter didn’t stick to the pan. Looking to try this, but I have a question on the use of Stevia and Erythritol. Why both? Could you not just use one or the other alone? I have made another traditional style cheesecake (KETO) using just Erythritol in granular and powdered form and it was great, Could I do that? Just asking as it is a little difficult locating both types of sweetener when I need it. Hi DM, I just don’t like using too much erythritol as it gives a cooling taste and gives me a huge headache. So I always it combine it with another sweetener like stevia or monk fruit. Do you need to put it in a water bath? If you don’t does it need the same cooling time? The water just helps the cheesecake not crack. You don’t need to use one. But you do need the same cooling time. First off, this cheesecake is AMAZING! Incredibly creamy and delicious. I made this for a friend who is following a keto diet for health reasons, and I was worrird because it was the first cheesecake I have ever made. I only had a 7 inch pan, so I made a 2/3 rds recipe. I could not find erithrytol, so I substituted xylitol, and it worked perfectly. Because it was a smaller cake, I decreased the bake time by about 8 minutes. I finished it off with the ganache and hazelnuts, and it looked as if I had puchased it at a fancy bakery. Thank.you for creating a simple recipe that made this beginner feel like a pro. Hi Diane, thanks for the wonderful comment! I’m so glad you liked it and that it was easy to make! Even for a beginner, you did the best substitutions so that’s good!! You’re already a pro 🙂 Hope you make some of my other cheesecake recipes too! My husband is going to try to make this for my birthday, tomorrow. I will let you know how it turned out. Hello, what unsweetened baking chocolate did you use for this recipe? Hi Stephanie, I link to the chocolate in the recipe card. It’s bakers unsweetened chocolate. Under #3 it says to add hot heavy cream to chocolate and that it will look like milk and oil are separating. I did not see amount of oil under cheese cake? Only see oil under Chocolate Ganache. Oil comes out of the chocolate. Chocolate is made of cocoa butter, which is oil. Hi. I just made this but my cheesecake batter wasn’t thick. It was more of a thick cream consistency. Did I do something wrong? It’s currently in the oven. Hope it doesn’t come out bad! Sounds fine to me. Should still be pretty creamy as it’s mostly cheese. Hi Melody, any type of oil will work. Shortening, olive oil, avocado oil, lard, butter, or ghee, or any type of vegetable oil that you eat. Hello. I don’t have erythritol or stevia powder. I do have Swerve Confectionery Sugar(? not really sugar but you know what it is!) and Splenda for baking. Can either or both of these sub for erythritol and/or stevia? If so, would you know sub ratio’s? Thank you. Can’t wait to try this. Doing fine with LC lifestyle but just like a little something sweet now and then and this seems perfect! Swerve is erythritol. And splenda is fake sugar. You can add the same amount as the erythritol, and add a tiny bit more. I would just taste it with my finger and see the sweetness I prefer. 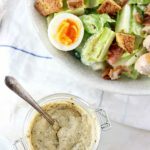 Could I skip the 3 layers and mix it all in one bowl? Do you think I could cut it in slices and freeze them? You can use normal sugar, probably honey too or maple sugar. Hi Jamie, the powdered one in the same amount weighs less than the granulated so I would slightly increase it. But honestly just taste test it with your finger until the perfect sweetness is there! You can also up the stevia powder. If I can’t get my hands on unsweetened chocolate, how much should I reduce the sweetener by? Looks amazing!! It depends on the sweetness of your chocolate. I would maybe skip the erythritol and just add some stevia and taste test with my finger until it’s sweet enough. Made this cake omg how good. Used pecan instead of hazel nuts. My family loved it. Thank you!! Pecans sounds amazing! Could you use a different nut for the crust? Would pecans or almond work? Looks so good! Hi Jolene, you can use any type of nuts for the crust! Made this for super bowl dinner, it had a good flavor but a 9″ springform pan was too big for the volume of the cheesecake, next time I will use a 7″ pan. Also 90 minutes @ 300 degrees was too long, it ended up dry and crumbly. I want to make this again, but I will start checking it at the 60 minute mark and if needed continue checks in 5-10 minute intervals. I made this cheesecake this weekend too but it did not crack at all. I used the 9 inch pan baked in 90 minutes and it came out just like the picture. Thank you!! Everyone loved it. Hi Laura, did you bake it in a water bath? Did you change any of the ingredients? That’s the only reason I see why it would crack or dry up if it wasn’t in a water bath. It’s also baking at a really low temperature so shouldn’t dry up at all. I’ve made it multiple times and that has never happened to me. The cheesecake should have filled a 9 inch cheesecake pan to almost the top as there was a lot of batter. Make sure to use the water bath and that the ingredients, and oven temperature are correct. yes, I did bake it in a water bath and followed all the directions and ingredients exactly. When I filled the 9″ pan the final dark layer barely made it to the edge of the to cover the previous layer and it looked to me that the contents didn’t quite make it half way up the pan. I obviously did something wrong. I will figure it out and also try to find a way to test the oven temp to be sure it is correct. I want to make the recipe again. Hmm, you didn’t forget the cream cheese/cream/sour cream right? It’s so odd that it would barely fit halfway through the pan, and that it dried up. It really shouldn’t do that. Hum, I followed . the recipe and it was exactly like Mira’s and my guests loved it. Perhaps your oven is hotter than the gauge says? I use a gas oven and it is usually hotter and it all went well. I’m not used to eat without sugar, but it’s a wonderful alternative. Still rich and soft. Hi Asfia, there’s a picture in the blog post of that step already. It’s the first picture of the steps. I’ll add the same picture to the instructions.